The Darjeeling woodpecker (Dendrocopos darjellensis) belongs to the family of sapsuckers and woodpeckers, the Picidae. 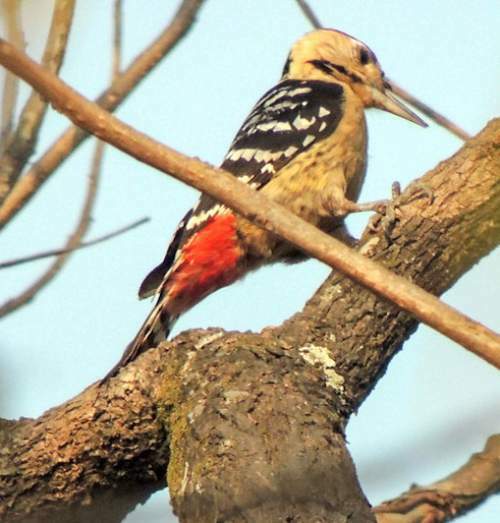 The Darjeeling woodpecker species is distributed in India, Nepal, Bhutan, Myanmar, China and Vietnam. These woodpecker species inhabit subtropical or tropical moist montane forests and high altitude shrublands. These woodpeckers are monotypic species. The Darjeeling woodpecker (Dendrocopos darjellensis) is a medium-sized pied woodpecker, measuring 20 to 25 cm in length and weighing 60 to 90 grams. The male Darjeeling woodpecker has whitish lower forehead. The upper forehead and crown are black. There is a narrow red nape patch. The hindneck is black. The sides of the neck and ear coverts are yellowish. The cheeks and lores are white. The long black moustache extending to upper breast. The upperparts are black with large white scapular patches. The flight feathers have white bars. The tail has white bands and bars. The underparts are dirty white with black streaks. The vent region is red. The bill is long and steel-gray in color. The irises are black. The legs and feet are pale grayish pink. The call of these woodpecker species is a loud "tsik" or loud rattling sound. These Darjeeling woodpeckers are distributed in India, Nepal, Bhutan, Myanmar, China and Vietnam. In India, these species are distributed in the states of Sikkim, northmost West Bengal, Meghalaya, Arunachal Pradesh, Nagaland, Manipur and Mizoram. In China, these Darjeeling woodpecker species are distributed in southern Tibet, Sichuan and Yunnan provinces. In Vietnam, they are distributed in the northern parts. The Important Bird and Biodiversity Areas (IBA) of these woodpeckers in Nepal are, Sagarmatha National Park, Phulchoki Mountain forests, Makalu Barun National Park, Mai Valley forests, Langtang National Park, Kanchenjunga Conservation Area, Annapurna Conservation Area, Tamur valley and watershed and Shivapuri-Nagarjun National Park. 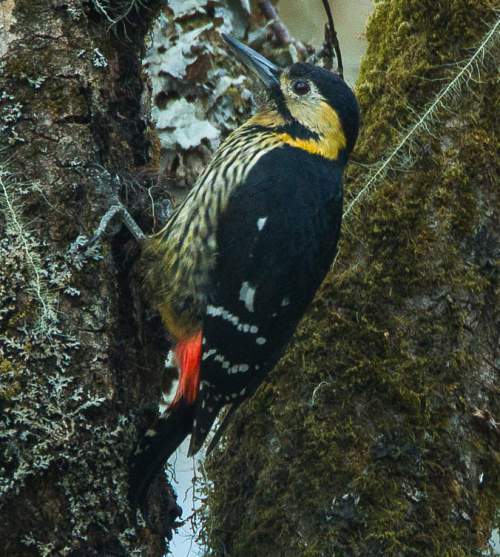 These Darjeeling woodpecker species have high forest dependence. They normally occur in altitudes from 1500 to 4000 meters. The natural ecosystems and habitats of these species include, tropical and subtropical moist montane forests, cloud-forests with moss-covered trees, evergreen forests and tropical and subtropical high altitude shrublands. The diet of this Darjeeling woodpecker consists mainly of insects. Insects, pupae and larvae of wood boring insects are their primary food. They also glean insect prey from the tree branches and foliage. The breeding season of these Darjeeling woodpecker species is from April to May in Myanmar, India and Nepal. These species are monogamous and territorial. Their courtship involves crest raising. They nest in cavities excavated by themselves. These Darjeeling woodpecker species are altitudinal migrant birds. They disperse locally after breeding. The populations in higher altitudes descend to the lower levels during winter. Post breeding, the juvenile woodpeckers may disperse and establish in new locations within the range. Within their range they may make local movements for feeding and breeding. The global population size of the Darjeeling woodpecker (Dendrocopos darjellensis) has not been quantified. The overall population trend of the species is considered to be stable. In most of its range, this woodpecker species is reported to be locally fairly common to uncommon. The generation length is 5.2 years. Its distribution size is about 1,820,000 sq.km. Habitat alteration and destruction and deforestation are the main threats that are endangering the survival of these woodpecker species. 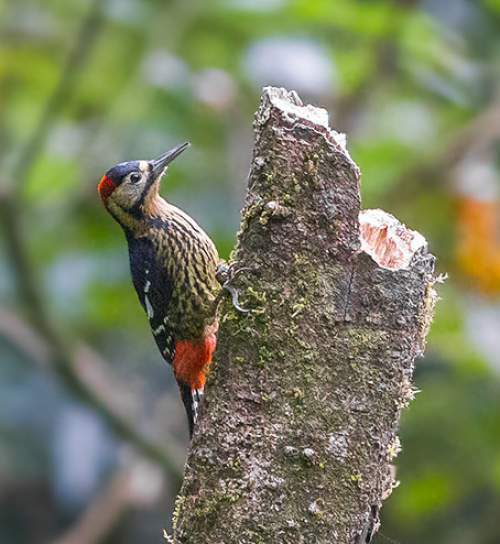 The Darjeeling woodpecker (Dendrocopos darjellensis) does not approach the thresholds for being Vulnerable, either under the range size criterion, or under the population trend criterion or under the population size criterion. The CITES (Convention on International Trade in Endangered Species of Wild Fauna and Flora) status is ‘Not Evaluated’ for the Darjeeling woodpecker (Dendrocopos darjellensis). The Darjeeling woodpecker (Dendrocopos darjellensis) is closely related to the great spotted woodpecker (Dendrocopos major). Current topic in Birds of India: Darjeeling woodpecker - Dendrocopos darjellensis.